The “Sistema Musei Civici” of “Roma Capitale Assessorato alla Cultura, Creatività e Promozione Artistica – Sovrintendenza Capitolina ai Beni Culturali (management of Museums services of Zètema Progetto Cultura)” complies with 15 new museums and archeological sites to the program worked out by the Google Art Institute to promote the knowledge of the most important museums in the world: the Google Art Project. 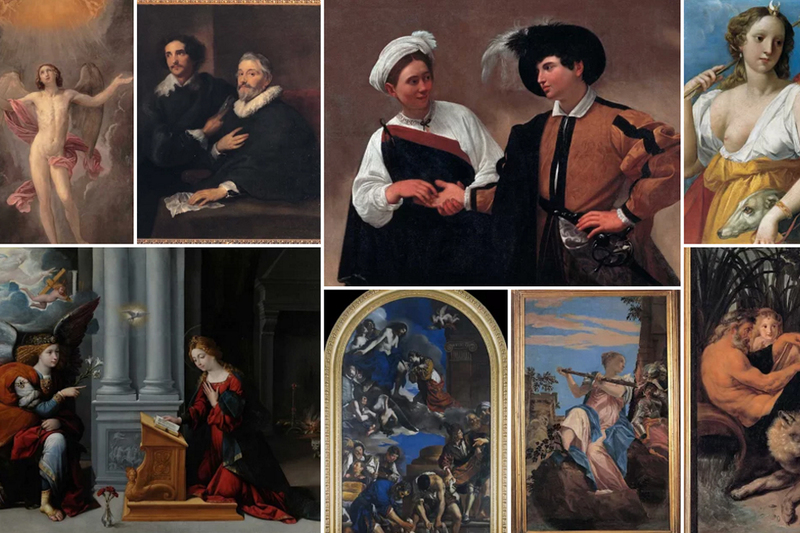 In addition to the l’Annunciazione di Garofalo in Capitoline Museums, 7 works of art were photographed and uploaded online ingigapixel giving the opportunity to observe in high resolution – by using about 7 billion of pixels available- these details are impossible to be seen by the naked eye: the gifts offered by the difunt represented in the long hieroglyphic transcription in the Stele del Dignitario Nefer (Museo di Scultura Antica Giovanni Barracco); the fragments of the colours on the textiles of the Mosaico con scene di caccia da Santa Bibiana (Centrale Montemartini);the faces of the viewers and the fantastic dresses for the Carosello a Palazzo Barberini in onore di Cristina di Svezia (Museo di Roma); the details of the the dress and the jewesl worn by Elisa Bonaparte Baciocchi con la figlia Napoleona Elisa (Museo Napoleonico); the fiery red brushstrokes in the Cardinal Decano by Scipione; the skeptical and participant eyes of Alberto Moravia nel ritratto di Guttuso (Casa Museo Alberto Moravia) and, finally, the frozen shades of de Chirico’s oil painting in Archeologi misteriosi (Museo Carlo Bilotti). 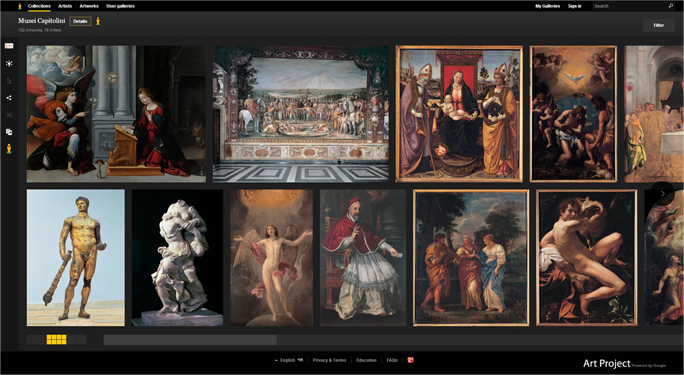 On www.google.com/artproject 15 photographic galleries, with a total number of 800 images, collect the most important works of art of the museum collections in Rome. 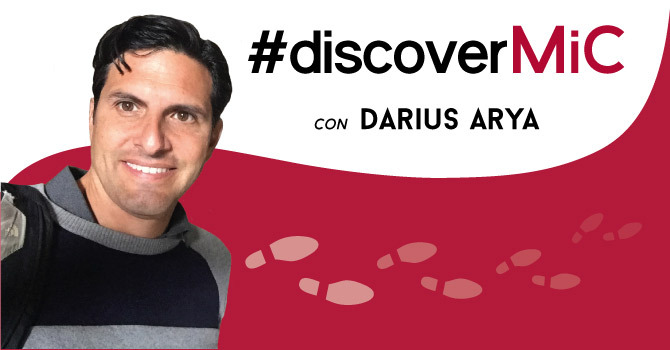 An immense heritage which can be used by students, tourists and simple curious, willing to browse among the works of art of the roman museums, but also to discover the hidden treasures. To the “Dying Gaul” or the Guercino’s, Caravaggio’s and Ruben’s paintings from Capitoline Museums you can add the ancient sculptures hosted in the “Centrale Montemartini”; the masterpieces by Mafai, Afro and Balla from the Galleria d’Arte Moderna di Roma Capitale; the finds of the Augustan, the Flavian and the Trajan Age from “Mercati di Traiano”; de Chirico’s, Wharol’s and River’s works of art from Museo Bilotti; the Roman model from Museo della Civiltà Romana, Caffi and Batoni’s works of Art from Museo di Roma, and also, the finds of the Bonaparte’s family of the Egyptian, Cypriot, Greek and Roman art, and the valuable Assyrian reliefs from “Museo Barracco”; the works of art and the relics belonging to the Bonaparte’s from “Museo Napoleonico”; the marbles, the models from “Museo Canonica” and after all, the works of art from the “Musei di Villa Torlonia”, from “Casa Moravia” , from “Museo delle Mura”, from “Museo dell’Ara Pacis” and from “Museo di Roma in Tarstevere”. 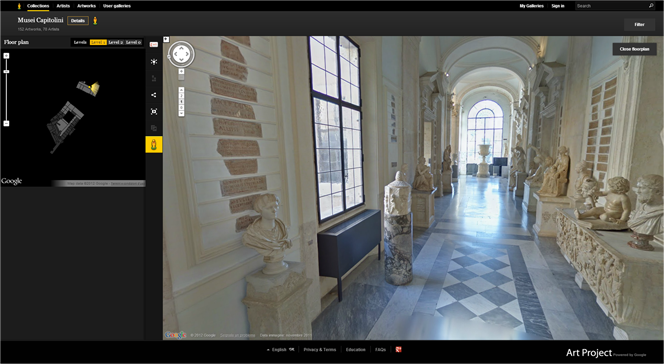 Besides, it’s possible to make a virtual tour inside the 12 museums of the system thanks to the Street View technology which allows to browse at 360º and to get a closer view of the artworks, and to eximine them closer. 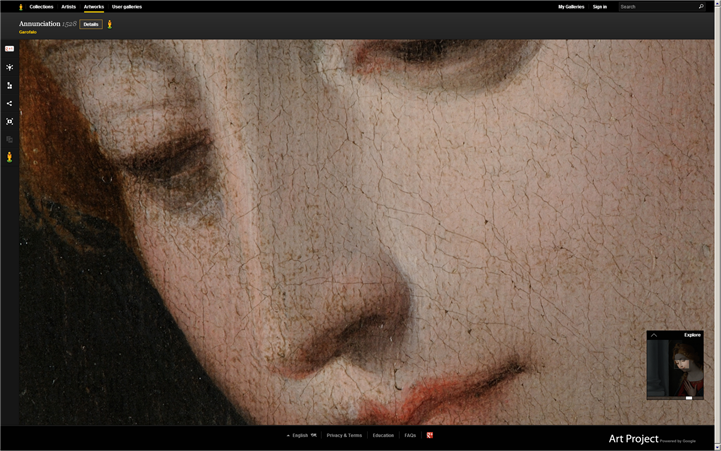 The Google Art Project, is part of the Google Art Institute, and it is a platform online by which people from all over the world can have access to to the high resolution images of the most important workarts made avalaible from the museums partners of this activity, with the aim “to increase” the access to culture and its preservation for the future generations. 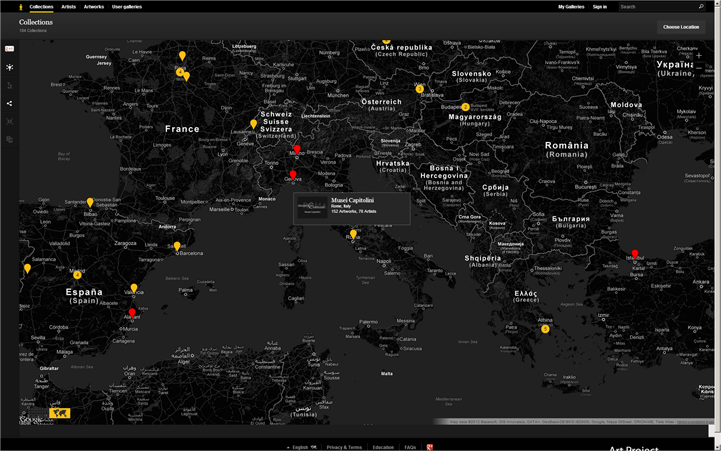 The project, launched on 11th february 2011 in collaboration with 17 museums, includes more than 63.000 artworks and 345 partners. The number is destined to increase. On www.google.com/artproject the visitors of the platform can browse the workarts according to the: name of the artist, title, type of art, museum, country, and period of time. 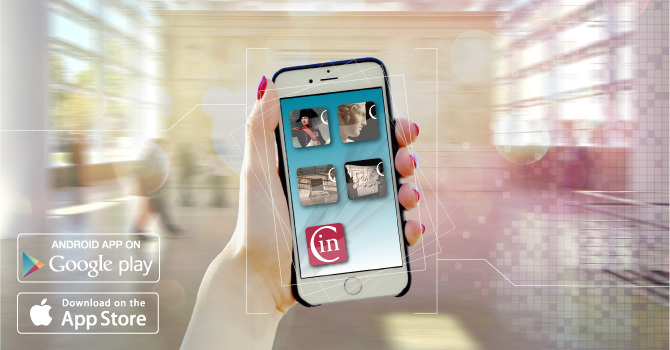 Facebook, Twitter, Google+ and the video are integrated in the platform, allowing the users to invite their friends to see and discuss about their favourite workarts. Among the other options avalaible “Le mie Gallerie” allows to save the specific views of the masterpieces selected and to create your own gallery. Feedbacks can be added to each painting and the whole gallery can be shared with your friends. 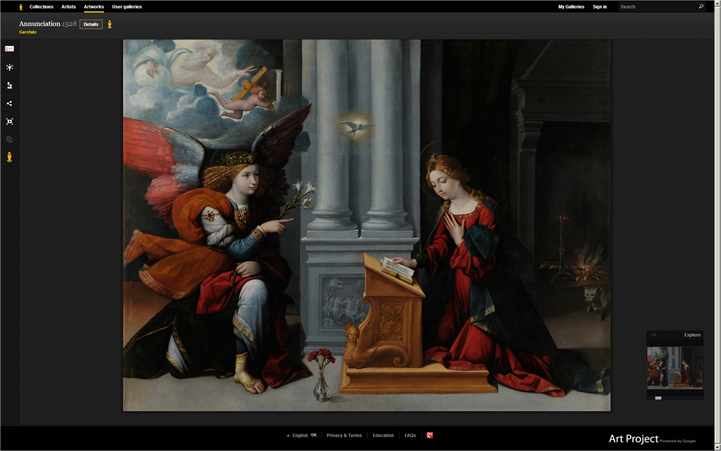 Furthermore, the option “Confronta” allows to examine the two works of art “side by side” on the same screen, to see closer how the style of an artist has evolved during the time, connecting the artistic moods, or analyizing two details of a workart. 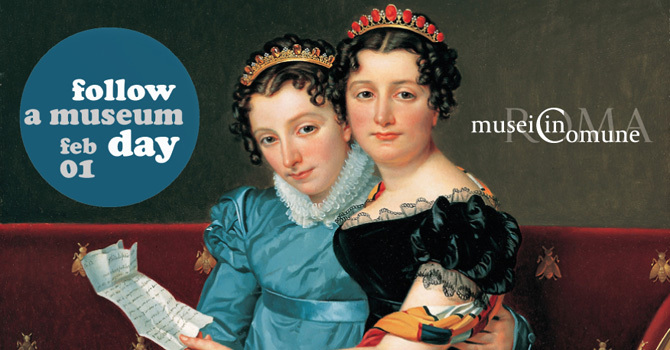 Google Art Project is classified as a “digital tool” allowing the users connected from all over the world to approach the artworks, the archeological finds and the artistic products with a simple “click” to find the most hidden details.